The new generation of charging stations. High-quality optics and efficient technology are perfectly combined in the wallbe® Premium CityLight. The solution is suitable for all locations in semi-public and public areas. Due to the integrated LED parking lot lighting, the wallbe® Premium CityLight offers two decisive advantages. Everything under control with the wallbe® Cloud. Use the wallbe® cloud-based online portal to control and monitor your charging stations. You have constant, complete control of your entire infrastructure, from individual charging points right up to entire charging networks. Enjoy real-time accessibility and continuous monitoring of all data along with easy-to-use consumer administration. The wallbe® cloud also enables fast, easy accounting and invoicing of the charging energy consumed. The wallbe® Cloud – the ideal supplement for control and management of your charging solution. The patented Solar Carport from wallbe® is an all-round solution offering eco-friendly, convenient charging under a roof with integrated photovoltaic system. Even in conventional car parks, the system takes up very little space and can be installed quickly. The design of the sturdy construction can be customised to your requirements. Sun4Charge from wallbe® is the most convincing way to charge an electric car using solar power. 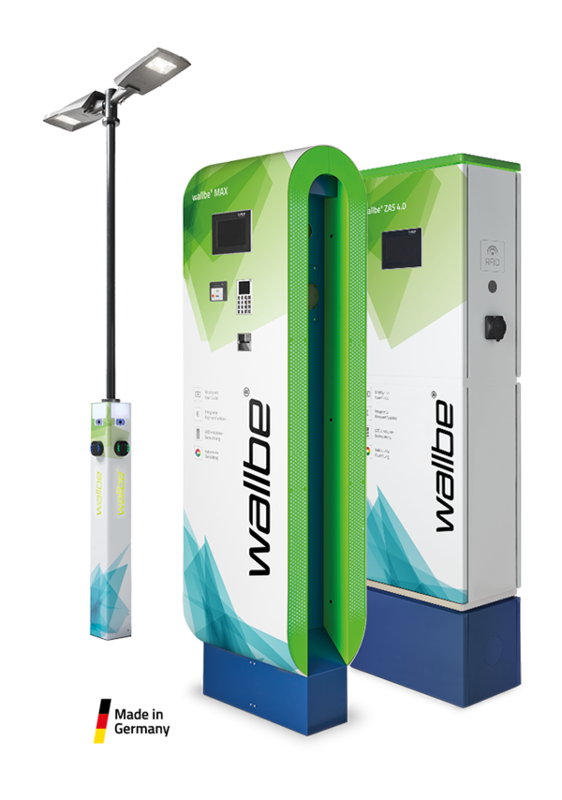 Electric vehicles need reliable charging stations – and wallbe supplies the ideal solutions. We offer not only state-of-the-art technology, numerous interfaces and IT support, but also a comprehensive service range that covers everything from advice and financing to maintenance. wallbe® means one-stop shopping, ensuring that you have the decisive advantage to safeguard your future. 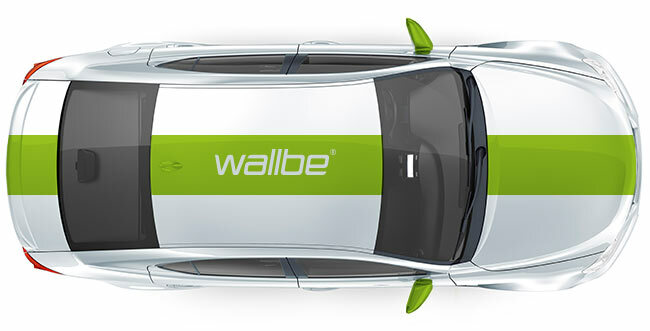 wallbe: the driving force behind your electromobility. wallbe® eMobility solutions enable charging points to be installed quickly, cheaply and in the minimum of space. Operating this kind of infrastructure means you can already participate in a market with high growth potential. Find out more about our comprehensive solutions portfolio here. 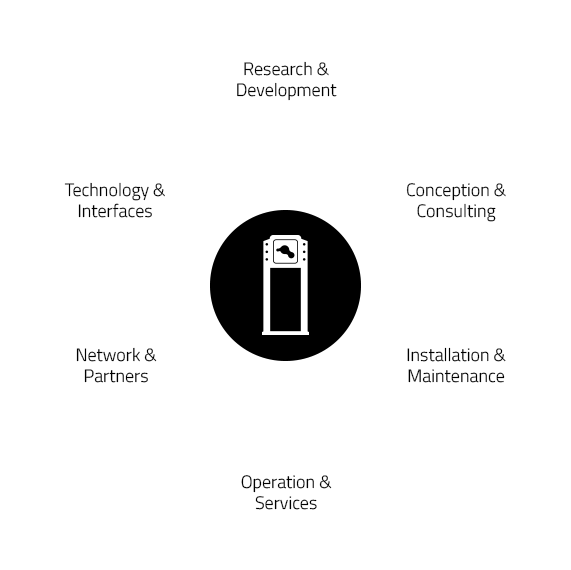 Our customers appreciate our competence and expertise in the creation of all types and sizes of charging infrastructure – we are a one-stop, full-service provider who offers advice, planning, execution, installation and maintenance. Using only high-quality materials and components, and in collaboration with our trusted partners and suppliers, we have been working for many years on the continuous development of our solutions. Our aim is the long-term improvement of their performance, convenience and durability. The future of mobility is electric, and wallbe® already plays a major role in the advances being made in this field. Our smart charging solutions, carefully planned networks and efficient control bring together all the necessary aspects of modern charging. Find out more about our company, objectives and concepts. Benefit from our years of experience and cross-industry eMobility projects.